The Coinhive service was always intended to help people mine cryptocurrency for good, but we’ve mostly seen it deployed by bad actors hijacking people’s CPUs without their permission. UNICEF is giving everyone a chance to support refugees with the mining tool just by opening a webpage. 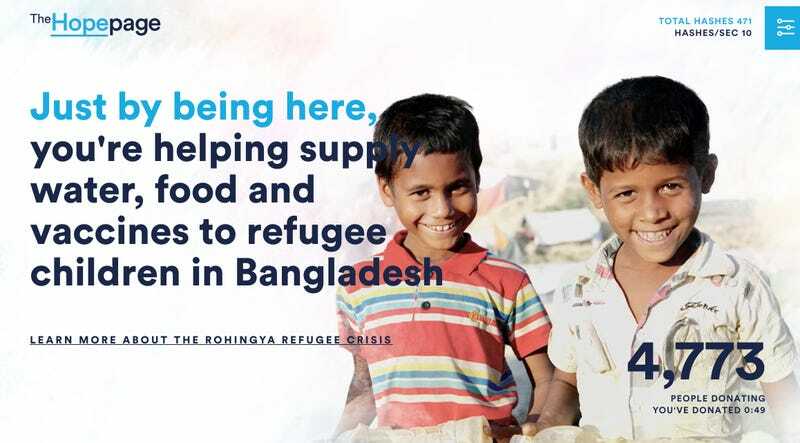 The humanitarian program is trying to raise money for the 400,000 Rohingya children who’ve been forced from their homes in Myanmar due to violence against their religious community. The refugees have fled across the border to Bangladesh where resources are strained and many children have been separated from their families. Through the wonders of the internet, you can help get safe drinking water, food, and shelter to those who need it by opening this page in your browser and letting it mine a cryptocurrency called Monero. Once you’re on the page, click “start donating.” A slider control will appear with a number above it—this adjusts how much of your CPUs power will be dedicated to mining. Set whatever number you’re comfortable with, hit donate, and leave to page open. That’s it. You can minimize the page if its in your way, but as long as it’s open and left undisturbed it’ll help generate funds. If it’s not working for you, check if you have an ad blocker enabled. In the top right corner you can see the speed at which you’re mining. I set mine to use 30 percent of my CPU and it says it’s generating around 36 hashes per second. At that rate, although rates will surely vary for each user, you’d need thousands of people mining to generate one monero per day. That’s $241 based on today’s exchange rate—not a ton of money, but it could go a long way. At the moment, 4,700 people are currently on the site, and of course, many of them may be offering up a larger percentage of their CPU. What’s this costing you? Some pennies worth of electricity and you can open fewer tabs before your computer starts to drag. You have too many tabs open anyway. Just be sure to watch your laptop battery and if you’re working from the office, leave it open all night. Giving a hand is the least your employer can do.